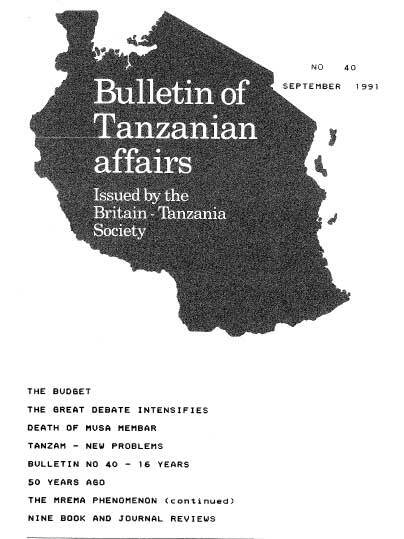 What was described in the Daily News as a ‘Consolidation Budget’ was presented to the National Assembly by Tanzanian Finance Minister Stephen Kibona on June 23 1991. The budget was generally welcomed as it continued the Tanzanian tradition of addressing the plight of the ordinary man whilst at the same time introducing a number of new measures aimed at improving the very weak state of the economy as a whole. – ‘Bureaux de Changes’ would be opened at airports and border posts to facilitate exports – Daily News. The ‘Presidential Commission on Political Change’ has continued its tour of Tanzania during the last three months and more and more people have been expressing views – usually very strongly held views – on whether the country should or should not change from a one-party to a multi-party political system. There has also been vast coverage of the debate in the media. The main arguments pro and con were summarised in Bulletin No 39. – ‘under a multi-party system the armed forces would be depoliticised and would therefore not be affiliated to any political party’ – Mwanza resident Robert Silas whose remark was applauded by the crowd. Many other views have been quoted in the press. Early impressions of the debate suggest a division between the majority of peasants favouring the one-party system and better educated urban residents forcefully demanding a change. But the Commission has a lot more time. It is not due to present its report until March 1992. The following day President Mwinyi conferred on Mwalimu the Order of Mt Kilimanjaro First Class, the first Tanzanian to be so decorated. Further ceremonies took place on the third day at an emotional airport send-off when Mwalirnu left for his Butiama home village – Daily News. Brooke Bond Tanzania Limited plans to build at Ngwazi, Mufindi, the biggest tea factory in the world according to a 1991-2011 Development Plan prepared by the company and presented to President Mwinyi during his visit to Iringaa at the end of July. The new factory will be built with the latest tea processing technology. It will have a capacity of 8,000,000 kgs of made tea and will bring total production capacity of the firm’s four factories to 18,483 tonnes compared with a present annual capacity of 6,764 tonnes. The number of people employed will increase from 6,000 at present to 8,200 – Business Times. I have been to Tanzania twice. In the middle of 1989 I found myself standing inside an air- conditioned bank in Mombasa, queuing to change a travellers cheque… I turned away from the counter and locked past the security guard, through the frosted glass doors and onto the street. As I stood and as I watched, an old man pulled himself along the dusty pavement with his hands, dragging his spastic legs along beneath him. It was a recurring theme throughout our six weeks in East Africa. I, the foreigner, waiting to change my western currency which would probably be worth more in Kenya shillings than he would ever own. Herein lies the gulf that separates Us from Them. And yet poverty, on this scale, is not really that different from the begging which we see in most European cities these days. What is different is the overall poverty of the nation. This poverty was much more apparent in Tanzania, where we moved next, than in neighbouring Kenya. Since the early sixties, when Kenyatta and Nyerere took their respective nations down very different paths from independence, these two republics have grown further apart. Kenya has, quite successfully, trodden the path towards capitalism. While Tanzania remains the limping socialist state – an economic slave to its massive international debt. Yet by concentrating on the profiles of the countries I think it is possible to overlook what is actually happening to the people who live there. I met a Christian in Nairobi waiting for a bus, who had grown cynical of President Moi and his false front – as he saw it. He had been forced, through lack of money, to leave school at sixteen and was now working as a labourer for about £l per day. To complete his last two years of education would have cost him £350. This, he knows, is too much for him. He knows too, that, if he could complete those vital years he could escape from the mire in which he is stuck. “It all depends on who you know”, he told me. It was very sad to see such an obviously intelligent person so frustrated and helpless. In sharp contrast, In spite of the multitudinous problems which face Tanzania, the people whom we met and worked alongside in Iringa ware so contented and radiant. As the Pastor of the Anglican church said to us after dinner at his house one night, in his slow and deliberate English “….though we are poor, we are rich in spirit”. It would be simplistic and stupid to conclude from this that, although Tanzania’s economy is in a pretty bad way, its people are far happier than their neighbours in Kenya. I was, though, left with the overall impression that, bearing in mind their respective situations, the Tanzanians were more cheerful than their counterparts in Kenya. It was especially clear, from our limited insight, that the churches in Tanzania are not allowing their circumstances to stunt either their faith or their vision for the future. The work which our Tear Fund Task Force Teem was doing involved clearing the foundations for a new cathedral in Iringa. This reflects the growth of the Church in Iringa, and the vision of Bishop Mtetemela for the Outreach Zone – now the Diocese of Ruaha. From the moment we arrived it was clear that we were welcomed as the world-wide family of God. Surprisingly quickly we had made some very close friends – not least the children, to whom we often gave wheelbarrow rides on the building site ! Wherever we went we were treated as guests of honour and looked after extremely well. When, after only three and a half weeks in Iringa, the time came for us to return to Britain, I realised how deeply we had become involved in the community. And even though, by this stage, many of us had been ill, some seriously, we were all very sad to leave Iringa and some very dear friends. It was a marvellous way to spend the summer and to give something back after being spoiled for so long in our opulent and lazy society. I have many memories still clear in my mind (not least that of being woken up at five o’clock in the morning in a hotel in Mombasa by a woman screaming as her husband beat her). The lasting memory though, will be that of the Church of Iringa, standing proud and strong despite all the difficulties it faces. My second visit was in 1990 when I was employed for the summer in the CMB Packaging (formerly Metal Box) factory in Pugu Road, Dar es Salaam. Sitting on board the M.V. Zaitun I watched as she struggled to tow a similar , if slightly more capricious, beast onward to Zanzibar. The trailing dhow had left Dar es Salaam twenty six hours earlier but, after an explosion caused by a battery wired up incorrectly, had been drifting for a full day with five of the crew lying dead on board. Meanwhile, back in the Haven of Peace, His Holiness the Pope was being driven from the airport in the state Rolls Royce along roads resurfaced for the first time in years. And so, while thousands of ecstatic Tanzanians in festive, papal tee-shirts lined the dusty streets of the town in the hope of a brief glimpse of Papa Yohana Paulo, five of their compatriots lay cold aboard a dhow in the Indian Ocean. These two extremes highlight well what for me is a real dichotomy of life in Tanzania. Whilst I was bluntly reminded from the one horrific accident of the endemic low regard for safety and of the implicit cheapness of life it was equally obvious from the other that this country, given the occasion, is as capable as many others. Again and again, in my work at the factory, mistakes were made which left me struggling to uncover the crux of the problem. Did I not explain, slowly and clearly? Did I not check and double check? Was the job too difficult? The situation was further complicated by the fact that every so often I would be taken aback by a particularly exact piece of work. Now and then I glimpsed the spark of pride which must be fanned into flame if this factory, and others like it, are to survive the difficult years ahead. It must be said though, that, at the end of the day, deadlines were met, and there were times of immense satisfaction and teamwork during my six weeks at the factory. ‘I do not want (the Africans) to repeat the mistakes we have made in Europe. Why must they too have factories and pollution and political p arties ? If that is what you mean by development, then, no I do not wish to see them ‘develop’. Why make them try for the impossible? It will only lead to unhappiness’. So does Tanzania need ‘aid’ ? Is there a place for the army of twentieth-century Vikings who have set up camp in their own village – Valhalla – just outside Dar? Should we pull out and leave Tanzania to muddle along as best she can? Are there any answers, or is Africa, with her colonial past and deep-rooted tribalism, a mesh of problems too complex to untangle? In 1990 I went back again to Iringa to see the other side of the country’s make-up. I was invited to lunch by the church carpenter and his wife in the two bare rooms which are their home. Typically they had prepared food for me, a Mzungu, which they could ill afford (he earns the equivalent of £65.40 per year) but their generosity and warmth towards me was something that brought tears to my eyes and I shall not quickly forget. Yet, mixed with their joy, they were mourning the recent death of their five-year old son from diarrhoea which had failed to be treated quickly and correctly. It was devastatingly humbling for me to be able to encourage them, and when the time came for me to leave, it was 1 who Pelt the poorer. It is this spirit and this love which so many of the Tanzanians whom I have met are so quick to give that makes the call to action so much louder. Surely though, the answer is not merely to throw money at Tanzania from our financial high-ground, After changing a fifty-pound travellers cheque in a bank in Arusha I gave the loose change from my small fortune to a leprous old woman who was begging on the pavement outside. She held out her fingerless bands and looked up at me with two blood-red eyes. As I walked away I asked myself what it was exactly that I had given that woman. I fear that ail that I gave her was money. For it is so much ‘cleaner’ and easier to give her of my pocket than it is to dig deeper in my heart and to give her the love and respect which she deserves as a fellow human being. Perhaps it is wrong to scale up the conclusions from this incident to a macroscopic scale but I think there is a lesson to be learnt here. Whatever we tell ourselves, it is actually very costless for us to part with some small quantity of money which can be sent to some small corner of our little world. It is very much harder to reach deep within ourselves and to give of what we are rather than of what we have. I knew that when I got back to the Oxford world I would be faced with the same issues which had confronted me in Tanzania. I knew that, as I walked through the Radcliffe Camera after dark, the same people would be silently crying out from their doorways. I only prayed that I would be strong enough to answer their cry and not just to do the easy thing and pay off any conscience. I fear that the day that I cease to hear them will be the day that I am the beggar for ‘many who are first shall be last, and many who are last shall be first’ What good is it to a man if he gains the whole world but loses his soul? HIV infection, AIDS and other sexually transmitted diseases would become a major disaster with far reaching repercussions in Tanzania and many other countries if not controlled soon. So said Prof Fred Mhalu of the Muhimbili Medical Centre at a recent seminar organised by the Tanzania Commission for Science and Technology (COSTECH), He said that the HIV infection rate was between 5 and 15% in urban areas and from l to 15% in rural areas but that in Bukoba town the rate was about 30% among adults. Country-wide some 800,000 people had HIV infection. “During the 1990’s AIDS is expected to triple the adult mortality rate and reduce expected population growth by up to 30%” he said. However, there had been significant falls in new cases of other sexually transmitted diseases in some parts of the country – Daily News. It seems to be the exception rather than the rule for a railway to be self-financing and it is certainly true that the Tazara Railway depends heavily on government support. Nevertheless, in the long term, it would seem likely to provide an essential service to Tanzania in linking up Dar es Salaam with the potentially highly productive Southern Highlands. One of Tanzania’s greatest problems lies in the great distances that separate the most productive areas from potential markets and export outlets. Among the most important questions facing the Tazara Railway is its long term financial viability. Bilateral donors and the World Bank certainly did not consider its future prospects to be sufficiently bright to justify their financial involvement. In the end the Railway was built with Chinese capital and employing Chinese technical and managerial know-how. But the justification was not based solely on a careful evaluation of financial prospects. An overriding consideration was the short-term need to provide land-locked Zambia with an outlet to the Indian Ocean as an alternative to South African ports and in view of the liberation struggle in Mozambique. The railway was handed over to the governments of Tanzania and Zambia as a going concern by the Chinese in 1976 with a rated freight carrying capacity of 2.5 million tonnes per year. However, a maximum of 1.273 million tonnes in 1977/78 has never again been approached and in 1982 goods carried reached only 796 million tonnes or 32% of rated capacity. In 1989 goods carried amounted to 1.044 million tonnes on a declining trend (1.143 in 1988, 1.185 in 1987). The reasons given by the Government for this poor performance were insufficient motive power and rolling stock together with technical and manpower constraints. Inadequate maintenance of the permanent way over the years has contributed to the Railway’s difficulties. A consequence of this deterioration, exacerbated by a landslide between Mlimba and Makambako in 1989 was a reduction in the speed of trains. An increase in the turn-around time of wagons from 13 days in 1988 to 18 days in 1983 further exacerbated the problem. Shortages of spare parts and accidents have contributed to the problems of the Railway Authority. In contrast to the declining trend in the amount of freight there was a continuing increase in the number of passengers. The growth has been continuous since 1985 and by 1989 had reached 1,704 million, a 5.2% increase over the previous year. On the Tanzanian side this increase was attributed to the shortage of buses, the poor condition of the roads and the favourable level of rail fares in comparison with those charged on buses (1). Under the terms of the Tanzania-Zambia Railway Act 1975 the ultimate responsibility for the railway lies with the Joint Council of Tanzanian and Zambian Ministers set up under an agreement between the two governments on 2nd May 1975. The running of the railway was to be en trusted to a Tanzania-Zambia Railway Authority under a Board of Directors and constituted as a body corporate under the laws of both countries. The Council consists of three Ministers appointed respectively by each government, and is required to meet not Less than twice a year and to consider and determine all questions of policy and, in particular, to approve all major changes in tariffs charged and services rendered by the Authority; any major revision in salaries and conditions of service; all development plans; capital works costing more than five million shillings, or such higher sum as the Council may determine; the construction of new branch lines and the raising of capital. Thus the Council retains extensive and explicit powers of control. Being a political body, there is a clear danger of attaching too great an importance to short-term and political considerations. In the context of these powers the Authority is required to conduct its business in accordance with commercial principles and to ensure that, taking one year with another, revenue is sufficient to meet its outgoings, including proper allocations to reserves, provision for the depreciation of capital assets, the servicing of loans and the financing of pensions. The Authority is also liable to repay to the two governments any amounts contributed by them to the Authority’ s resources and the loan obligations to China (2). Financial viability in the sense thus required by law has never been attained and there is at present little prospect of commercial balance. With the restoration of Zambia’s access to the ports of Beira and Nacala and the opening of the highway between Dar es Salaam and Lusaka the railway now faces stiff competition in its cross frontier business. Moreover, the use by Zambia of South African ports is no longer avoided with the same tenacity as before and is likely to increase. The shortage of wagons led recently to an accumulation of 90,000 tonnes of Zambian cargo at the Port of Dar es Salaam of which 41,500 tonnes consisted of fertiliser and the rest wheat, vegetable oil, detergents, equipment and spare parts (3). Such delays are hardly likely to improve the Authority’s commercial reputation. Moreover, the effectiveness of the Board of Directors as commercial managers could be attenuated unless there is a definite policy of restraint on the part of the Council of Ministers or indeed, perhaps a change in the law. For example, a marked improvement in the salaries and status of maintenance staff might be judged necessary to overcome problems with the permanent way which have bedevilled the railway from the outset. But, as things stand, any such decision would require the consent of the Council. In existing circumstances the longer term prospects for the railway are bound up with economic developments on both sides of the border. Much of the Mbeya Region has considerable economic potential, which would be greatly enhanced by efficient rail communications. Such services will require improvements in the supply of wagons and motive power and a determined effort to reduce the turn-around time at the termini. The arrival, towards the end of 1990 of 17 diesel electric locomotives from America will have helped to relax the strain on existing resources but more will be needed. So far as the financial administration of the Authority is concerned, growing pressure by the Treasury will help the drive towards greater efficiency. (1) Hali ya Uchumi wa Taifa katika Mwaka 1989: Mpigachapa wa Serikali. Dar es Salaam. 1990. (2) The Tanzania-Zambia Railway Act. 1975. (3) Tanzanian Economic Trends. Vol 1. No4. January 1989. The main feature in Bulletin No 39 concerned what was described as the ‘Mrema Phenomenon’ and explained the energetic activities of the Minister for Home Affairs, Mr Augustine Mrema, in fighting corruption and crime. There has been no let up in his fight during the last four months. The real bombshell, however, came on June 8th 1991 when six people were rounded up at Dar es Salaam airport carrying TShs 136,624,009 in cash and travellers cheques and 11 ounces of gold worth TShs 36 million. Mr Mrema told newsmen that the businessmen who had been carrying the foreign exchange to Dubai had been allowed to go free because they were mere agents of ‘bigshots’ who were masterminding the racket. Some of the funds were sealed in African Pride tea packets. On July 5th it was reported that the entire haul (except the gold) had been returned to its owners in Zanzibar. Zanzibar Chief Minister Dr Omar Ali Juma told cheering businessmen at a meeting in early July that he wished to thank the Union Government for returning the money and added that “the People on both sides of the United Republic demand that the ‘big shots’ be named. Many others have been expressing similar views. ‘Africa Events’ later reported that a UN Volunteer had had his US$ 2,000 worth of travellers cheques nabbed and was awaiting prosecution and an FAO expert had had to leave the country after a US$ 1,000 transaction. Minister Mrema warned foreigners working in Tanzania ‘not to involve themselves in illegal transactions’ – Daily News.